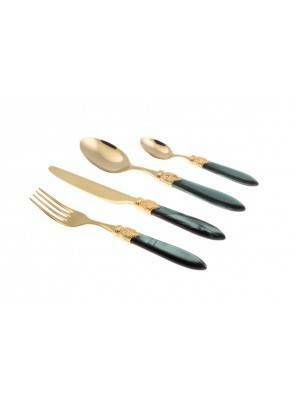 Stainless Steel Cutlery 18/10 and colored handle from the Laura collection by Rivadossi Sandro. Ring with an antique flavor and handle in glossy methacrylate give this classic series an aesthetic and formal balance. 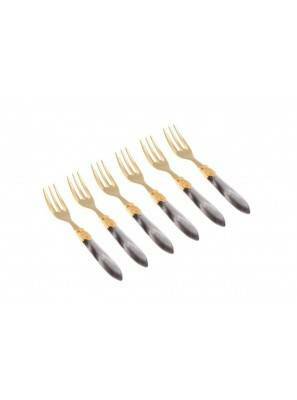 Prestige, with that ironic touch that does not hurt, in a table set with refined tablecloth and fine crockery. 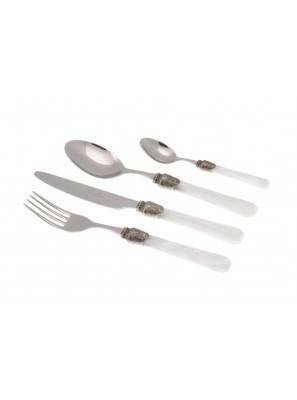 Rivadossi Cutlery is made with extremely innovative and quality materials, paying attention to fashion trends. A wide range of products, in compliance with rigorous quality standards, which is periodically enriched with new lines 100% Made in Italy to guarantee a qualitative excellence. Rivadossi ensures flawless tables in all circumstances, offering a wide selection of cutlery suitable for all types of table, with many accessories to accompany the meal from the beginning to the end. For each model of cutlery, in addition to the table setting, there are also cutlery for serving salad, dessert, ladle for rice or small ladle for sauces, roast knife and roast fork, forks for appetizers. Lots of accessories for a perfect table. Packaged in an elegant gift case.